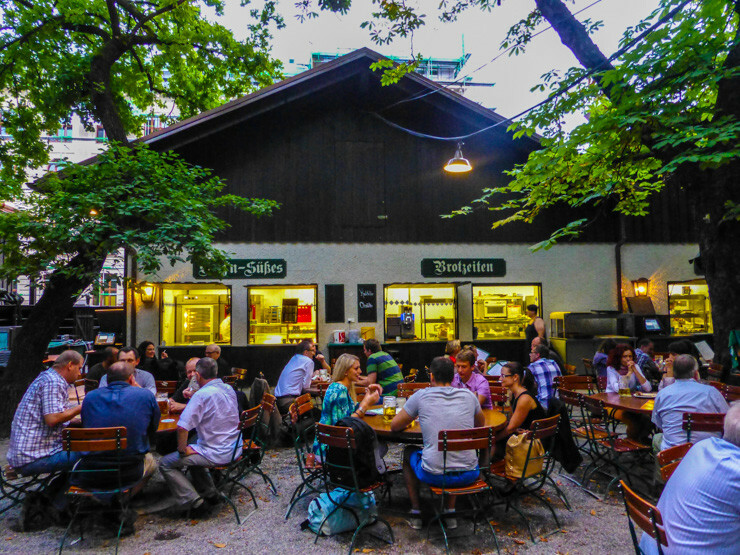 Reviews of Augustiner Keller and Hofbräuhaus Beer Gardens in Munich — find out which was my favorite. Enjoying some cool brews at a beer garden in Munich. 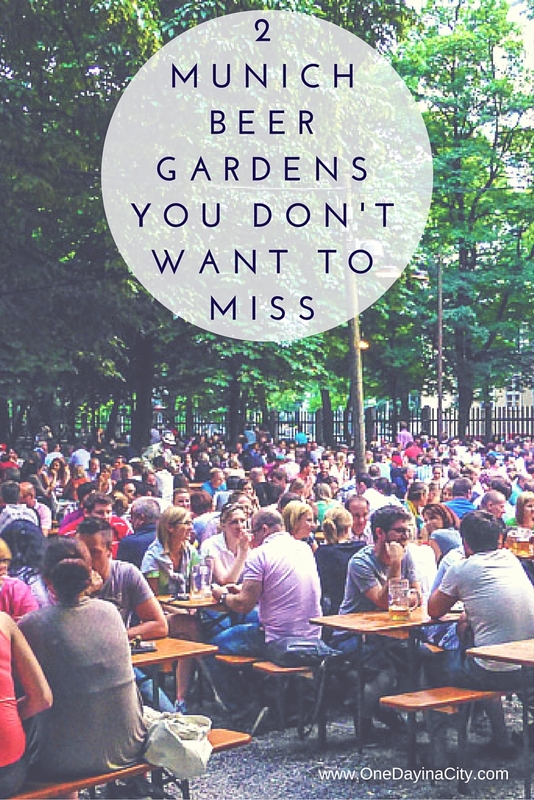 When planning my trip to Munich, there was one thing at the top of my list: visit a beer garden! I ended up visiting two and neither disappointed. 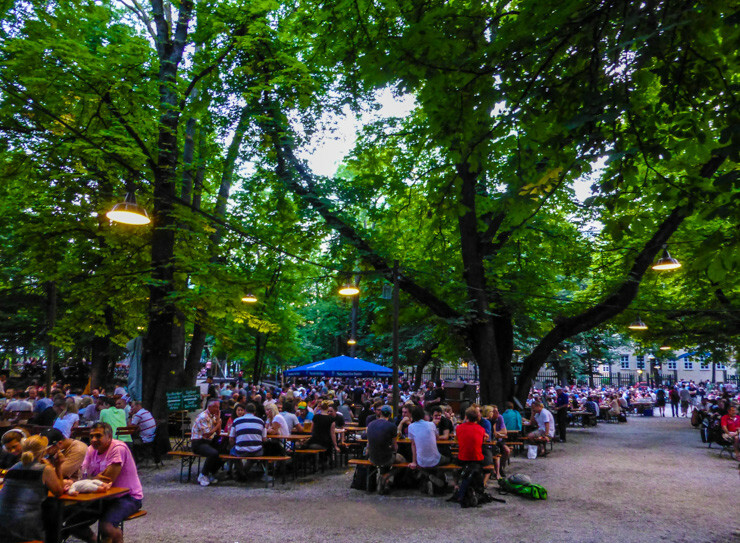 Yes, I know Munich is a city of great history and culture (which I did experience and you can learn more about on my One Day in Munich blog post), but the epic beer gardens I’ve always heard about were at the top of my to do list. 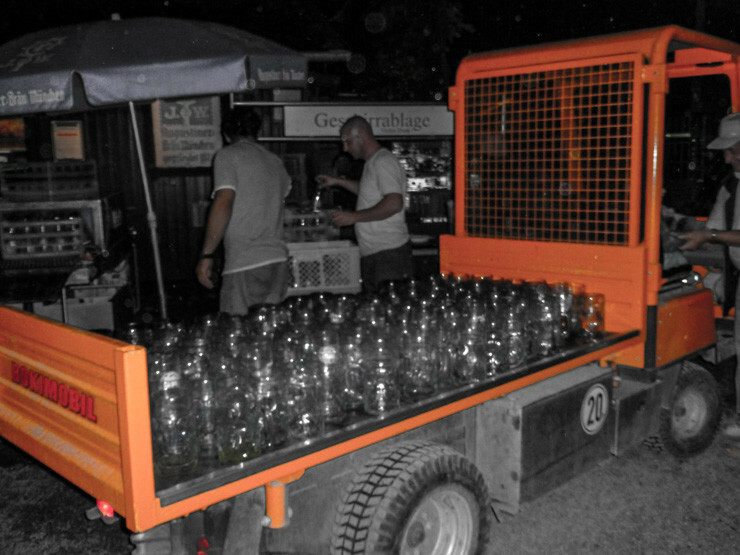 The beer gardens are so epic in Munich they need trucks to transport all the used beer mugs from the tables. After consulting guidebooks, blogs and two Munich natives I met in the Dolomites of Italy a week earlier, I had decided the beer garden I couldn’t miss checking out was Augustiner-Keller, a historic beer garden that dates back to 1812 and which brews its own beers. So the night my mom and I arrived in Munich, we quickly got settled into our room at Charles Hotel and then set off for a big German beer. Augustiner Keller. This place goes through a lot of beer each night. Upon walking through the entrance to Augustiner-Keller, the first thing I noticed was how green and leafy it was, like we were going beer drinking in a forest. 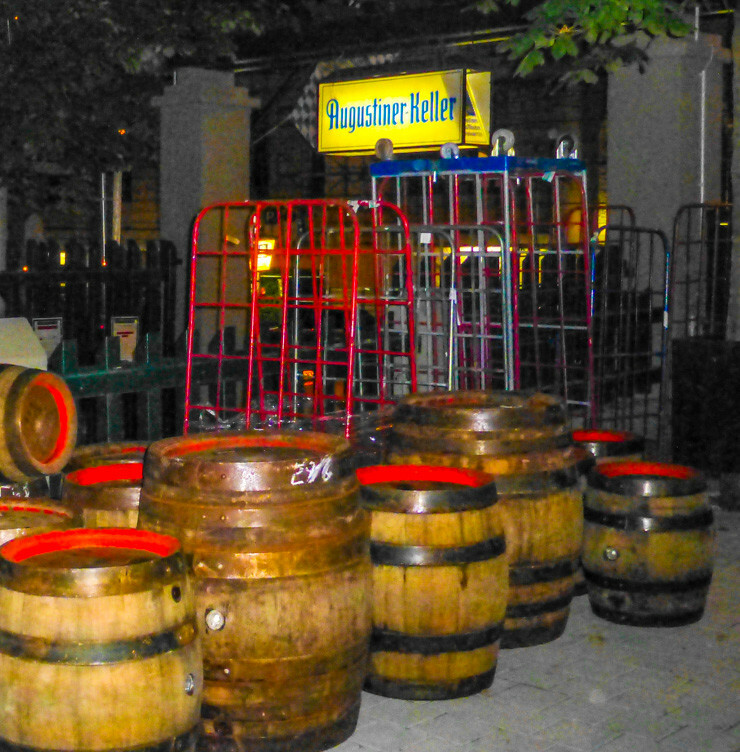 Augustiner-Keller has over 100 chestnut trees on its premises that you can enjoy your beer under the shade of. The second thing I saw was just how massive Augustiner-Keller is. It’s huge! Tables upon tables of the wooden picnic style spread back from the entrance, flanked by a couple one-story, open-air buildings (called tasting stalls) serving food and beer in a buffet line. 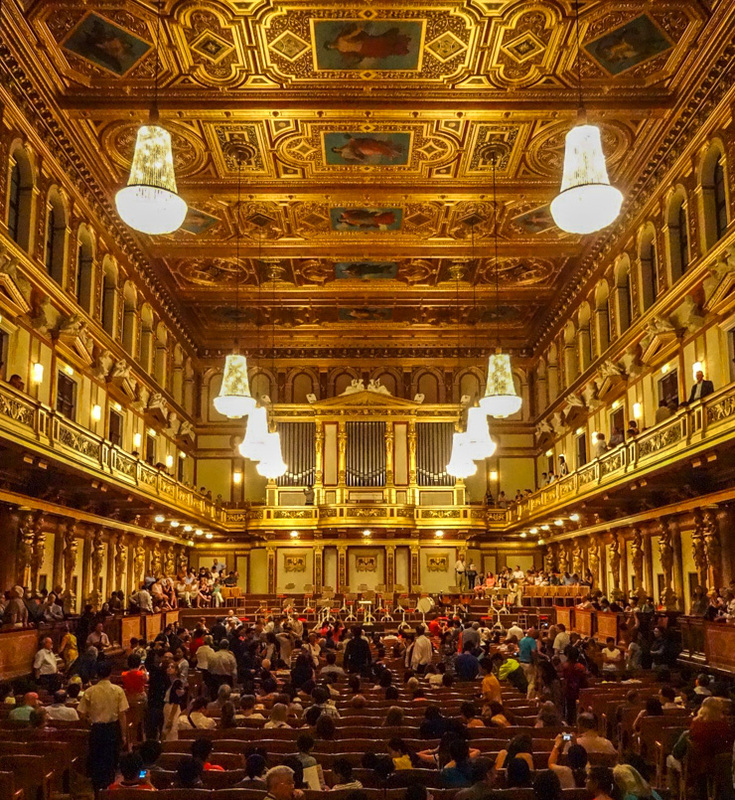 Over 5,000 people can be seated at Augustiner-Keller at one time. Huge trees framing picnic tables at Augustiner-Keller. These people got a prime spot right by the food. 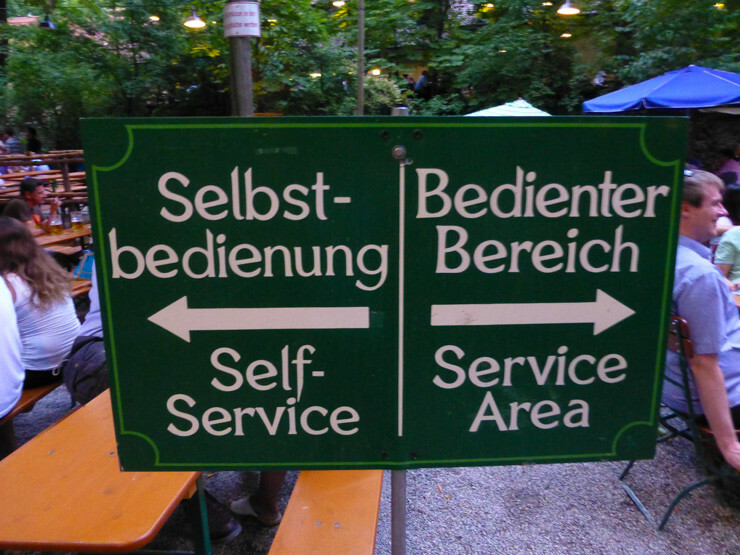 We went to the left. There was a section where servers would bring you food and drink, but we wanted the experience of going through the interesting looking buffet line (I could see bins stacked and wanted to check out what was in them) so mom and I headed to the one in the back since the front of Augustiner-Keller appeared overly packed in with people. The back at least seemed to have a few open tables. 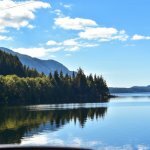 This was a popular place! We got in line and were soon staring at this. And since now my stomach was grumbling extra loud, I added a salad onto my tray (yes, they actually had something healthy, too) for good measure…and to help soak up some of that gargantuan beer. 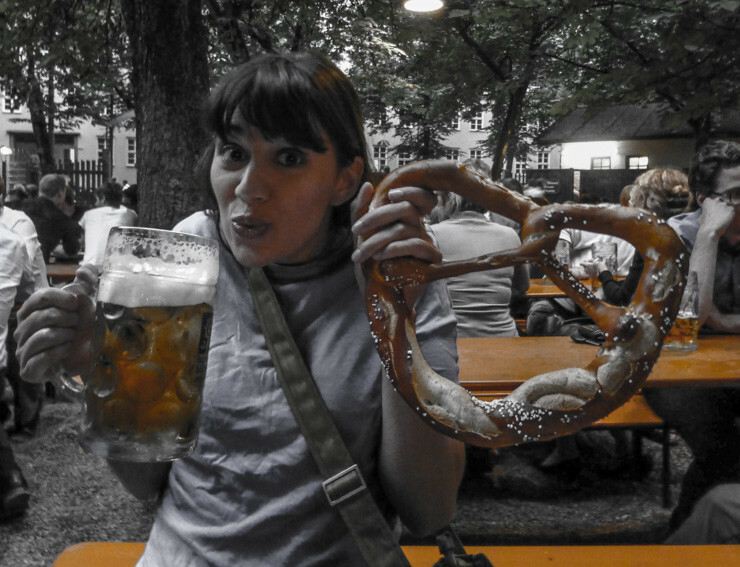 The massive pretzel helped with the soaking up business, too. The beer was malty and refreshing on the hot summer night, the pretzels were chewy and salty, and the ambiance was laidback and fun. 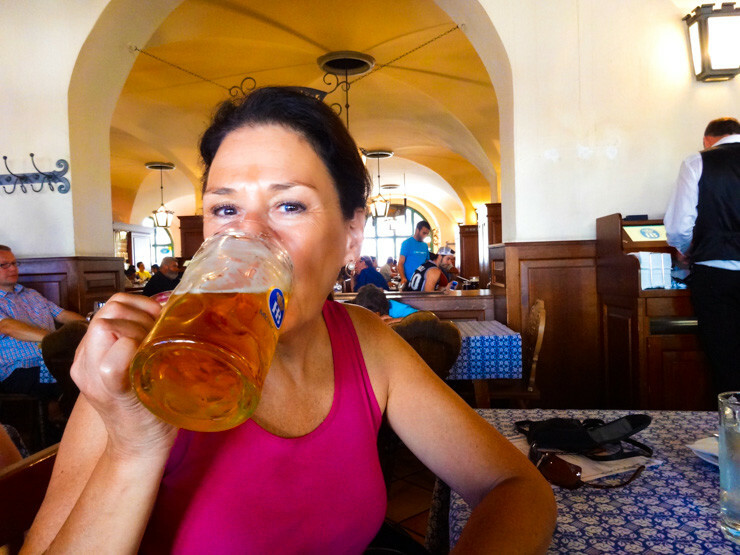 Yes, Augustiner-Keller was a memorable experience. 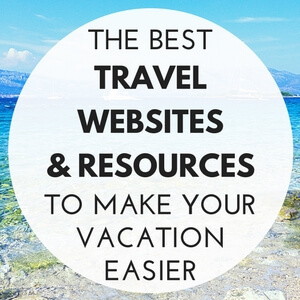 It seemed more than just a tourist spot, too. I could see myself going there for a drink after work or meeting up with friends for a celebration if I lived in Munich. Hofbräuhaus on the other hand, I could not see doing that. It had a distinctly touristy vibe. 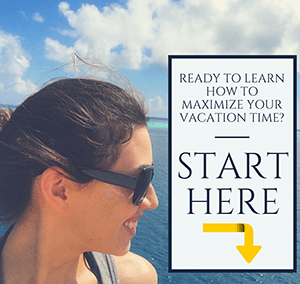 But I always live by the motto that things that are touristy are likely that way for a reason…because they’re fun, historic and/or interesting. 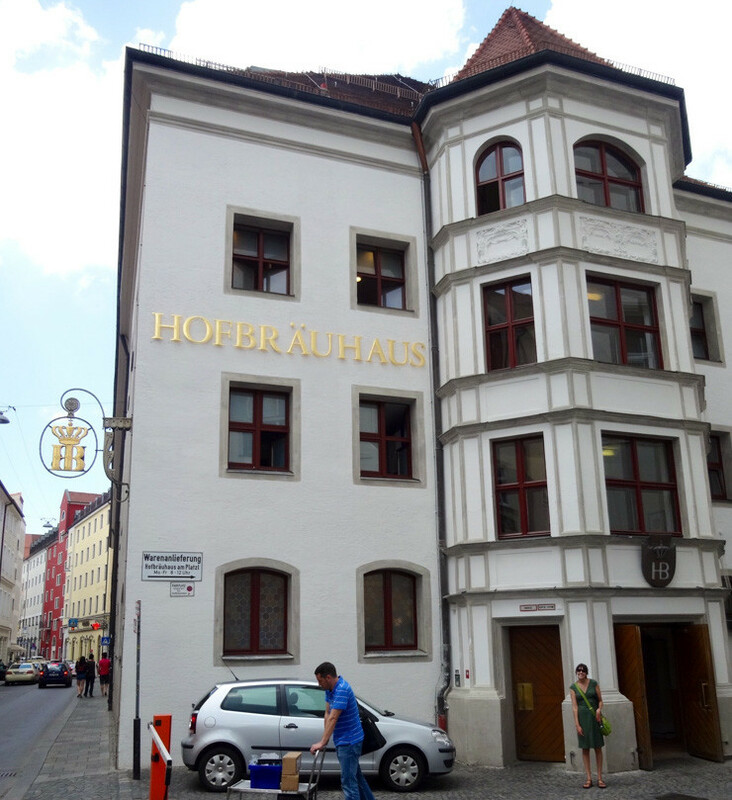 Hofbräuhaus was a combination of those three (mostly the first two) and is still worth a visit besides being on the tourist trail. Hofbräuhaus is located in an urban area of Munich. The first thing to note about Hofbräuhaus is that it doesn’t quite have a beer “garden” feel to it. This will serve you well in the winter months, but in the summer being indoors was quite stifling due to lack of air conditioning. 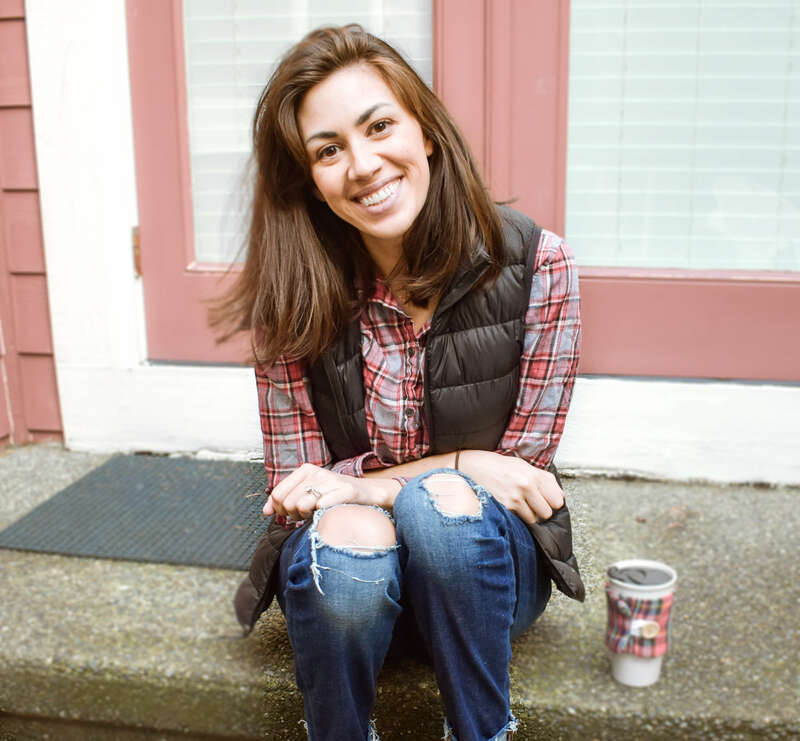 While there is an outdoor patio that serves as the beer garden, it was completely full when we arrived, so we found a table by a window and hoped to get some semblance of a breeze. 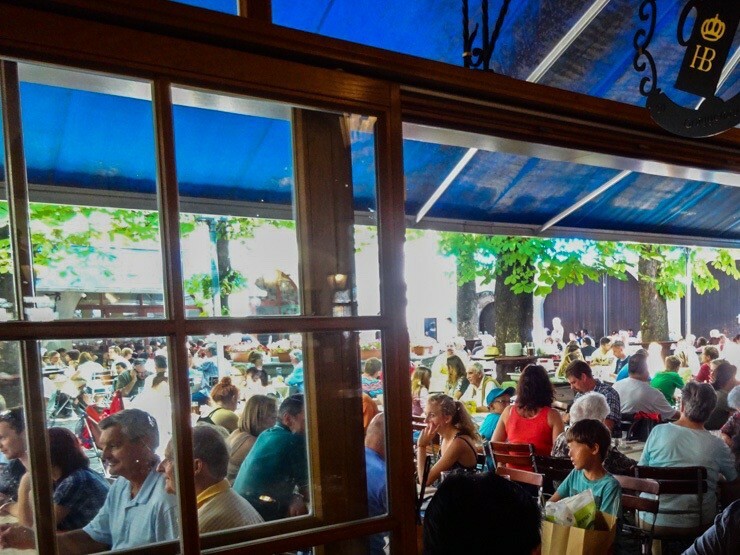 The crowded outdoor area at Hofbräuhaus. Inside is still entertaining and a good German beer experience because it is more like a beer hall, with massive, intricate ceilings and elevated platforms where costumed men performed traditional German folk music on stringed instruments. 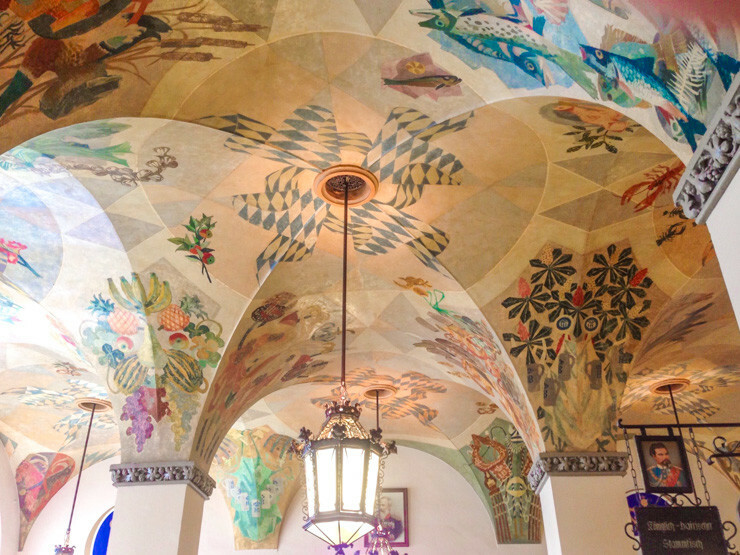 Eye-catching architecture and frescoes at Hofbräuhaus. 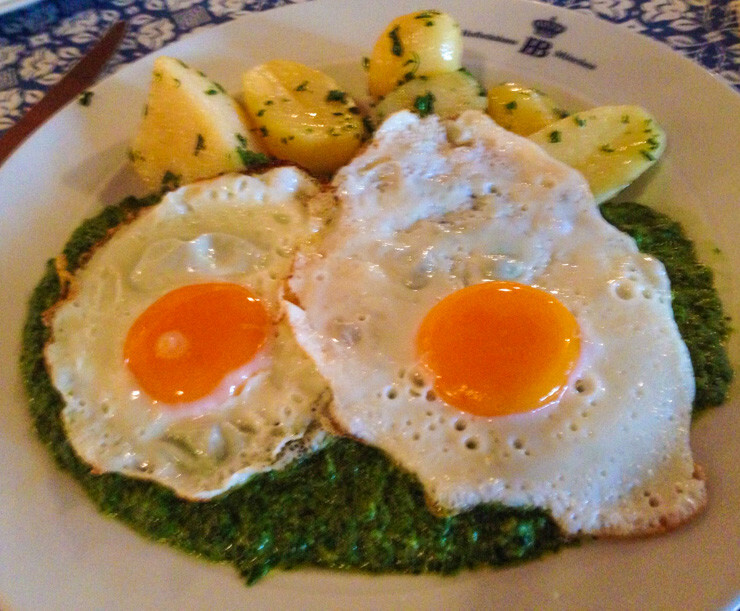 We went to Hofbräuhaus for lunch in the middle of sightseeing. Tired from exploring and from the heat, I couldn’t be bothered to find an English menu (if there even was one) or flag down our frazzled and slightly stern looking server to figure out what things were so mom and I decided to have a bit of fun with our lunch and order what sounded good…in German, which we can speak all of three words of. I selected the one that I did understand some of the words for: “Original Hofbräuhaus” followed by Brotzeitteller, whatever that meant. But it sounded like it was a specialty of the restaurant’s so figured I should do what they were known for. 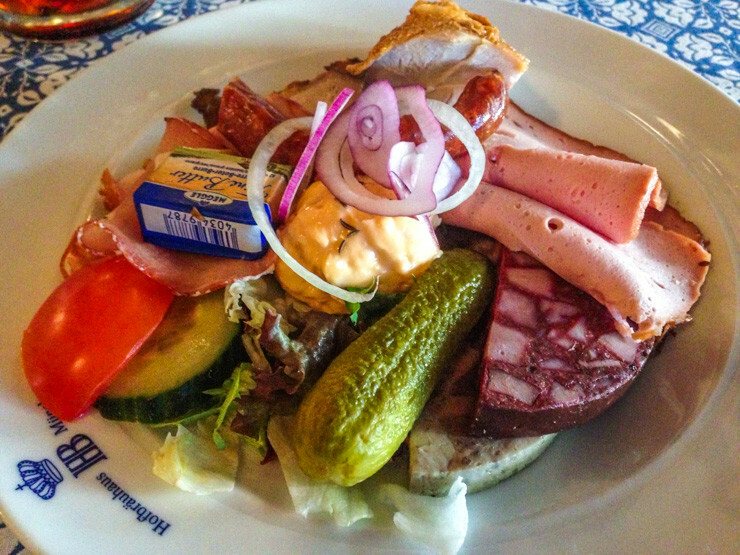 Despite ordering an appetizer, the portions were huge and it seemed to be Germany’s answer to Italy’s antipasto, so I dug in and filled my belly for more sightseeing. Mom’s surprise dish was more exciting looking, though looked like it was for breakfast. I have no idea what she ordered, but the mixture of eggs, potato, and green mush was quite hearty with a creamy deliciousness to each bite, of which I stole several. Oh yeah, and we were at a beer garden, so of course we had to get beer. 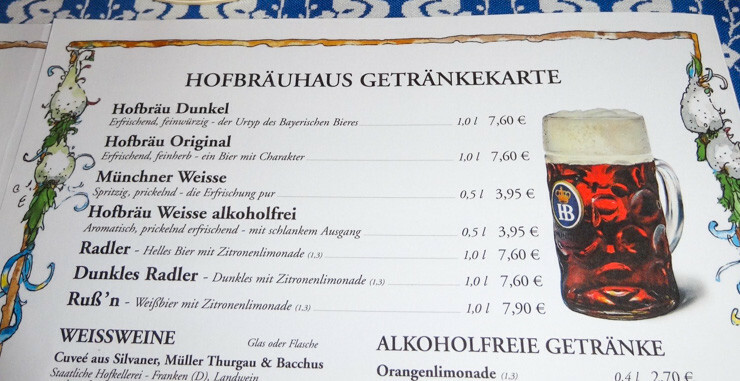 Like Augstiner-Keller, Hofbräuhaus makes its own beer with seven different types prominently displayed on the menu. 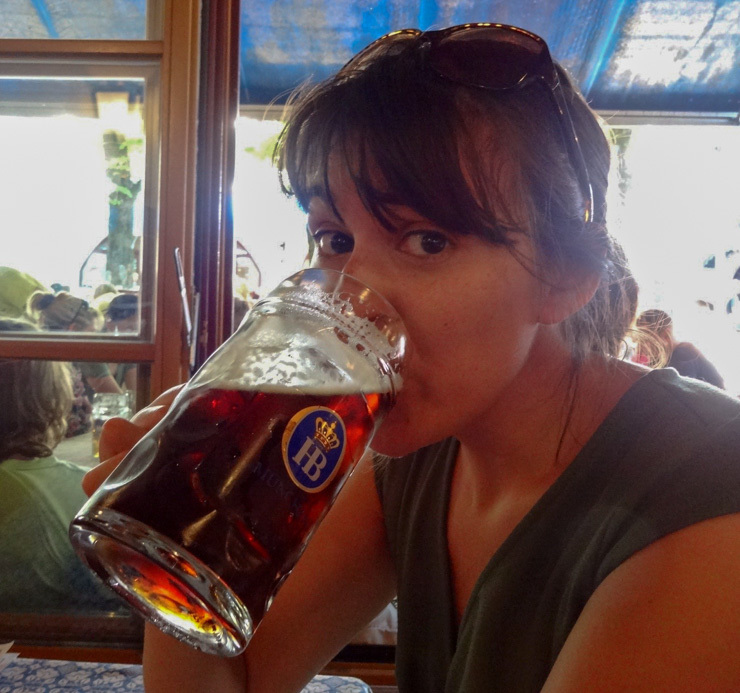 I ordered the Dunkel and honestly don’t remember much about that beer except how wonderfully cold it was to drink — and beer in Europe isn’t even served that cold, but it was so hot that day. Though I do also remember that the beer was a bit more mild than I usually like as I enjoy strong flavors in my beer. But again, knowing what I was reading on the menu probably would have been helpful in ordering something more suited to my tastes. 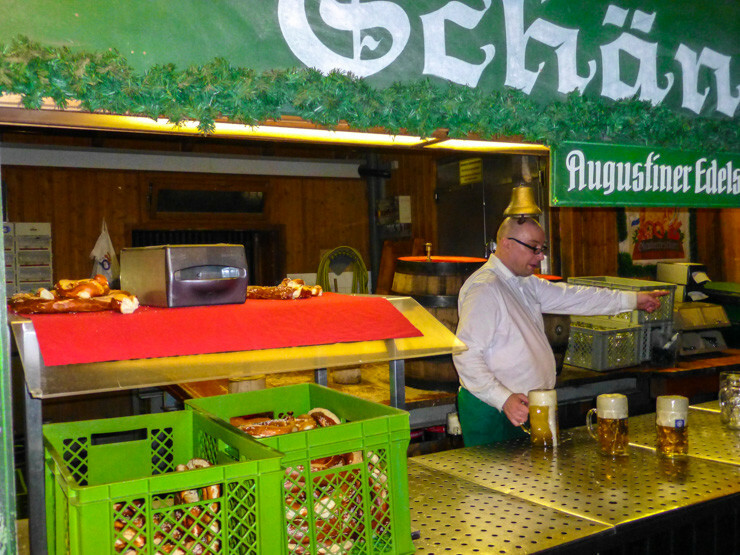 Ultimately, if short on time in Munich and you only have time for one beer garden, I would check out Augustiner-Keller. 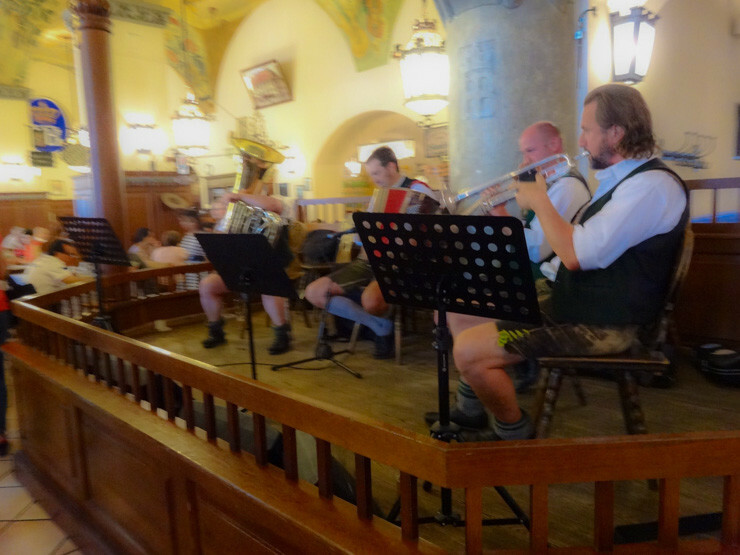 But if you have extra time, it’s still fun to stop in at Hofbräuhaus for a quick drink and to listen to some live music. 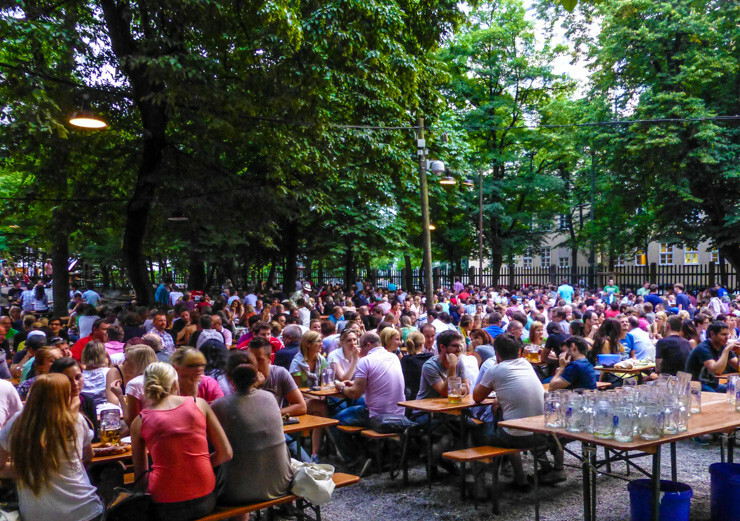 What: A massive beer garden that dates back to 1812. 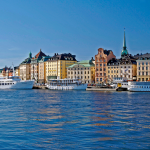 There is also an indoor beer hall where you can experience more of a restaurant vibe. 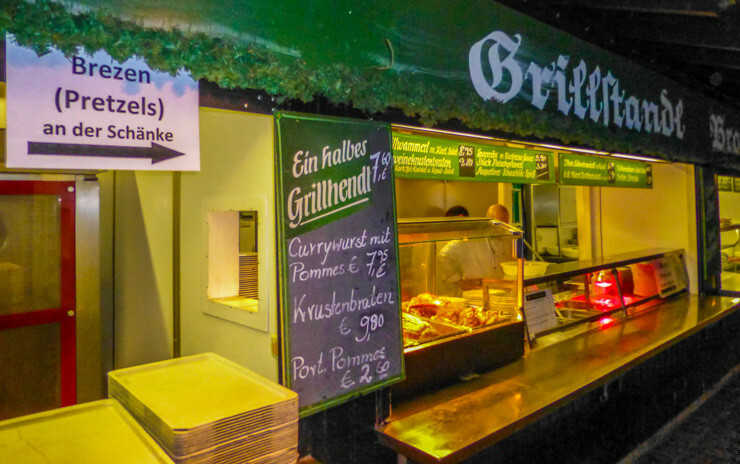 What: Traditional German beer hall with live music and a small garden area. 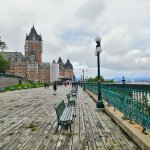 Don’t forget the names of these breweries! Pin for later.